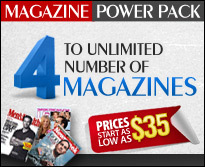 ReceptionMagazines.com customers will receive their magazine subscriptions within the quoted magazine delivery time frames or they will receive a 100% refund for their subscription. The official delivery time frame is within 12 weeks from the date of purchase. If 12 weeks time passes from the date of purchase, and a customer has not received their first issue, then a full and prompt refund will be issued at the customer's request. If a refund is requested, then a cancellation notice will be sent to the publisher instructing the publisher to terminate the purchased subscription.